Virtuous Giving includes the ability to create multiple donation forms to publish on your website. Before you create your first donation form, you'll need to set up your Virtuous Giving account. 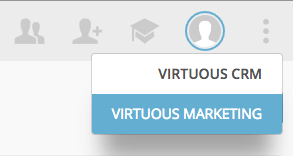 Once that's done, navigate to the Forms page in Virtuous Marketing to get started. Once in Marketing, select the Forms page from the left-side menu. Now, you are ready to get started on your first donation form! To begin, give your donation form a name. The name will be your only identifier for this form, so it needs to be unique. Instead of just calling it "donation form," be as specific as possible, like "Main Page Give Now Form for 2018 Website Refresh." Or, heck, name it "Timmy" or "Sally Ann," if you want to. So long as the name is unique, you'll be good to go. 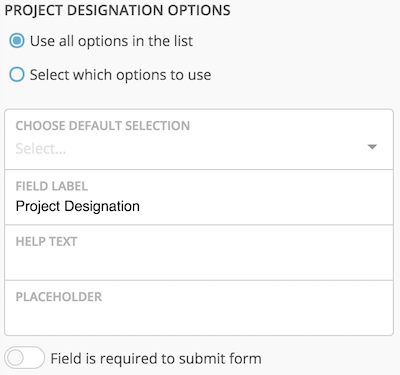 After naming your form, you'll have the option to select default values for a Project, Segment, and Premium. These values will be assigned to any Gifts made via this form. So, if this were going to be the general donation form on your web page, you might assign a Segment for "Online Giving" and set the Project as "General Fund." Premiums assigned will always have a default quantity of 1. You can skip assigning default values, if needed. There are other options for assigning Segments and Projects, which you'll see below or elsewhere in our help center. Once you have named your new form and made the necessary default selections, click NEXT in the lower right to move on to the Build screen. On the build screen, you'll see that a default form has already been configured, with the most commonly used and required fields already set. If you like, you can use the default form as-is; simply save and publish your form to use it in your site. If you'd like to make changes, you can click and drag to rearrange the form fields however you like. Click and drag any additional fields from the left side of the screen to add them to your form. Click on the trash can icon on any field to remove it from the form. Some fields, like Credit Card Number and Email Address, will not have a delete icon as they are required and cannot be removed. Many of the fields available should be familiar to Virtuous users, as they are used elsewhere in the system. The "Heading" and "Paragraph" fields are specifically designed for donation forms, allowing for a title and a block of descriptive text to be used as part of the form. Use the Label field to customized the actual field label shown on-screen. 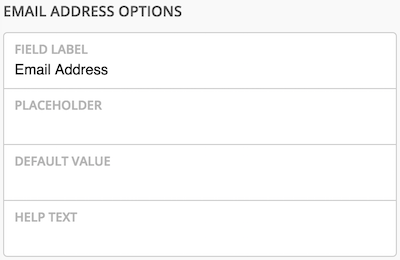 For example, you may wish to Have the Address fields specify "Home Address." Some field labels, like those for credit card information, cannot be edited. As a best practice, organizations should use caution when editing the label on the "Donor Pays Costs" field. It is best to avoid using the term "Fees" in this space as that has a negative connotation. Use the Default Value to pre-fill any form field with a value of your choosing. This can be particularly useful when applied to custom fields that need to be captured with Gifts from a specific form. Help text will display below any form field in italics, as shown in the above example. The Check by default option can be used on fields like the "Donor Pays Costs" option to make them select by default. Donors will need to uncheck the box to opt out of paying the transaction costs. Use the Field is required to submit form to make any field required. This will add an asterisk next to the Field Label. The Field is hidden option can be used in conjunction with the Check by default option or Default Value to make sure that Gifts submitted via your form always have certain values set, even without your donor knowing it. For example, you may wish for all Gifts made on a certain form to come through with the value "Fall Festival Sponsor" in a custom field called "Sponsorship Type." You don't want to run the risk of donors editing this value on the form when making a donation, so you pre-fill the field and make it hidden. First, you may choose to make all Projects available and let your donor select the right one. You may also choose to select only a handful or Projects, to limit the choices available to your donors. In order to be used in a form, Projects must be set as "Active," "Public," and "Is Available Online." Any Projects that do not have all three options selected will not be available to use in an online form. For some clients, specifically those who may have field staff raising their own support, displaying actual field workers' names may not be desired. In these cases, be sure to set a value for "Online Display name" on the Project and that alias will be used when displaying the Project in your donation form. As you edit your form, you can click on the Actions menu in the upper right to save or view a preview of your donation form. Once you have finished editing, you will need to publish your form to make it available for use on your website. When you are ready, save your form and click Next to continue. On the next screen, you'll be able to specify what your donor will see once they make a donation. You may choose to have a thank you message appear directly on0-screen, in place of the donation form, or have them redirected to another page on your site. The thank you message should be brief; you will have an opportunity to send a receipt or thank you as part of your usual gift processing. When you have configured your form, you are ready to move on the the final step. Once your donation form has been published, you'll need to post it to your website. On the embed page, you'll have the option to either copy the code snippet to your clipboard so you can paste it into the correct page on your site, or you can send it directly to your web developer.